The moon jar is a clay vase original from Korea, accurately from the Joseon Dynasty (1392-1910). The big shape of this jars is the greatest peculliarity of itself. 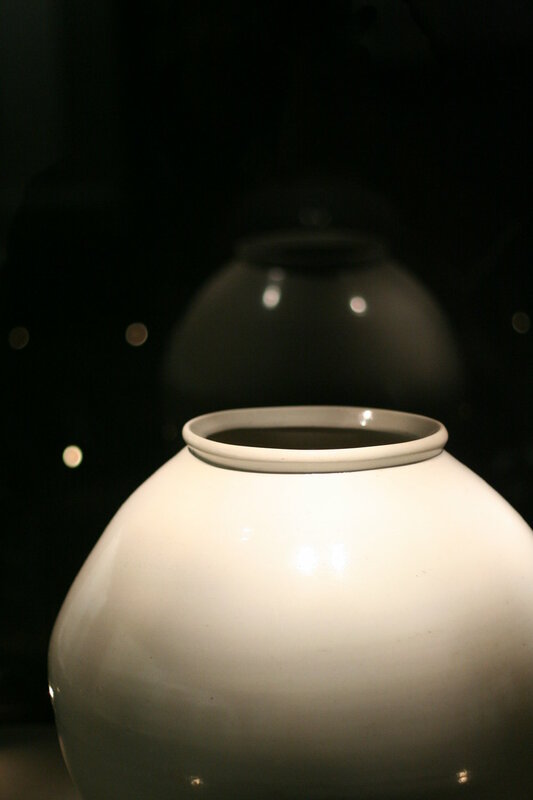 In the begining of the process, the moon jar is a tender white piece of clay that grows to became a big glazed sphere. This process has four basic stages: forming, biscuit firing, glaze and glaze firing. In the first stage, ussing a press and pull tecnhique the clay become soft and easy to sculpt. It's neccesary to mix the perfect quantity of water with the clay to help the artisan to sculpt two hemispheres. When the two parts became one, the artisan has to clean and correct the imperfections of the surface, a battle against the imperfection, the force of the loss of shape. This jars have not perfect shape and, from this imperfection, born it's attractive. When the base of the jar is smaller than the top, creates the illusion of floating. This proportion and the spherical shape of the vase resembles the full moon. Young Sook Park is an artisan who has dedicated her life to mastering the art of traditional Korean pottery-making. She is the responsible person of the renaissance of the Korean clay making including tea pots, moon jars and table ware present in permanent collections around the world. In a time in which we have the obsession to fill everything, a vase of this size with a huge superior opening that does not pretend to be filled by anything, makes us think about our rhythm of life. Magnifficent and inattentive to the attention of the others, just standing there, very conforting to just look at it.